You have a runny nose and you sneeze often. 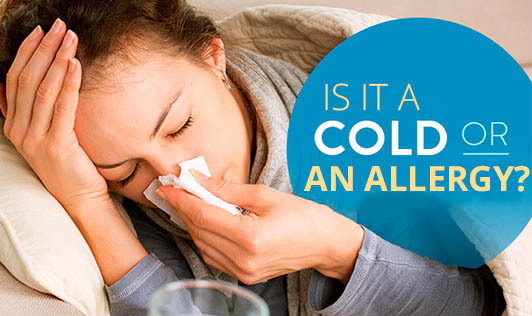 Is it a common cold or an allergic rhinitis? Sometimes you might find it difficult to differentiate between the two. Or you might pop a pill thinking it's problem 'A' and it might turn out to be problem 'B' for which the pill will not work. Common cold is caused by a virus but allergy is a response to an overactive immune system. You can spread the cold to others or you can catch a cold from another person. Allergy, on the other hand, is not contagious. A cold can last from 3 to 7 days, but an allergy can last for weeks, months or years depending upon how long you are exposed to the allergen. Cold is very often accompanied by a mild cough, body pain, sore throat and tiredness. Allergy is sometimes accompanied by a mild cough and tiredness but never sore throat and body pain. Even though both problems have a runny or blocked nose, the mucus from a cold is yellowish but the mucus from an allergy is colorless. To prevent a cold, avoid physical contact with an infected person and maintain personal hygiene. To prevent an allergy, avoid the allergens which cause the problem or take suitable medication after consulting a specialist.